Rare and exceptional pre-columbian Zapotec pottery figure! High quality Pre-Columbian pottery figure, Mexico, Zapotec Culture, ca. 200-800 AD. 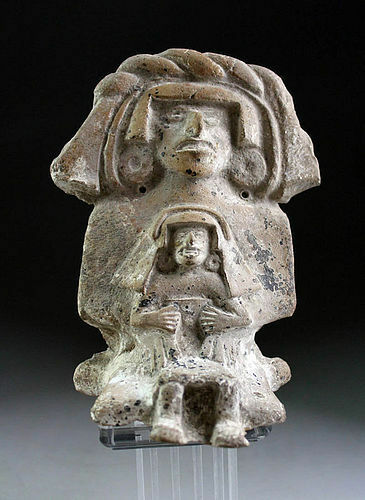 A very rare figure of a seated elite male with large headdress and a smaller figure seated on his lap. Grey pottery. Size: ca. 15 cm. high. Condition: Intact and superb for this type, which is normally always restored. Exceptional Jaguar Shaman pre columbian pottery vessel, Guanacaste Exceptional Double Chambered Peruvian Vicús pottery vessel! High Quality Pre-Columbian Mexico Vera Cruz Pottery figure!